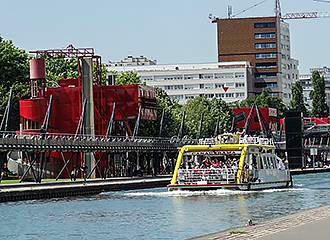 The Canal de l’Ourcq waterway is classed as one of the Paris canals even though a large part of it is outside the city limits, and was constructed in the 1800s to provide additional water to the city along with additional cargo shipping channels, but is now used mainly for pleasure cruises and recreational activities as it passes through places like Parc de la Villette and the Sevran Forest. It was Napoleon Bonaparte that first ordered the creation of a canal back in 1802, so that new shipping channels could be created, which meant that barges could then avoid the River Seine, but it was to have a dual purpose of also supplying water to the city of Paris as well which it still does today. With funding from supplemental wine taxes and other finds, the person put in charge of the project was Pierre-Simon Girard and work first started in 1804, with the idea that the water within the canal should be flowing, in order to provide drinking water that would not be stagnant, yet be slow enough to aid navigation of barges. The canal was also meant to feed the Canal Saint-Martin and the Canal Saint-Denis, and the first part to be constructed was the downstream section by Paris itself, and in 1808 the Bassin de la Villette was first filled with water. By 1813 the Canal de l’Ourcq had reached Claye-Souilly and in the August of that year the first boat navigated the canal, however, after the fall of the French Empire, work was halted. Work resumed after the Bourbon Restoration, but a problem was discovered, when they contractors realised that the canal was too steep and the water was actually flowing too fast to be deemed safe, and this is when five locks were added to aid navigation and slow the water current down. So, going from the Bassin de la Villette right the way through the beautiful forest of Sevran to the Port-aux-Perches near the village of Troesnes, the Canal de l’Ourcq was officially opened to canal boats in late 1821. However, the supply of water into the Canal de l’Ourcq was still inadequate for the needs of the waterway traffic, which caused damage to the banks. And so, Napoleon III in conjunction with Baron Haussmann, decided to take water from the River Marne in order to maintain more constant levels, which meant that two pumping stations were constructed at Trilbardou and Villers-les-Rigault. The came the destruction of numerous warehouses and stores by the Communards in 1871 and the wooden lock bridge at the Bassin de la Villette was also destroyed, and so, during the years 1880 through to 1883, the Bassin de la Villette was rebuilt, deepened and widened, plus a new swing bridge was put in place. But the canal de l’Ourcq and the swing bridge was also deemed to be too narrow for the larger commercial cargo vessels now navigating the canal, which meant it was replaced in 1885 by a vertical lift bridge called the Pont de Crimee, and the canal was widened. 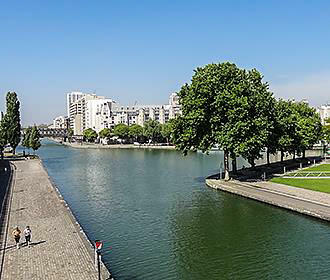 Today the Canal de l’Ourcq, often referred to as just the Ourcq Canal, is actually over 108km in length and has ten locks in total, and links with the Canal Saint-Martin at the Bassin de la Villette. 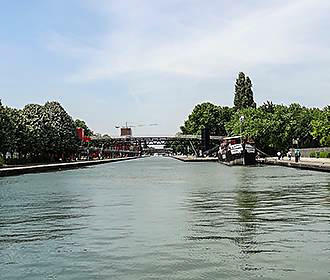 Also, this historical waterway is the smallest navigable canal in France and has different sections including what is known as a wide gauge canal where there is a lock free stretch of approximately 10km by the Bassin de la Villette. Yet there is also a narrow gauge canal that goes from Les Pavillons-sous-Bois to Mareuil-sur-Ourcq, and originally this section saw specially designed cargo boats called flutes travelling up and down this long stretch of canal, until 1962 when operations ceased due to being not economically viable. And since 1983 the canal has been designated for use by pleasure craft and you will find many different tours and canal cruises in Paris like Canauxrama that will take you along this wonderful canal where you can discover its rich history including the 1885 hydraulic lift bridge of the Pont de Crimee, which is still in use today. 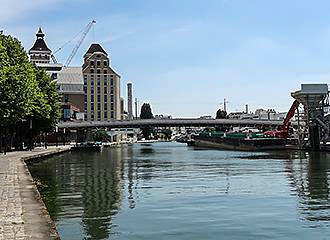 So even though most of the canal traffic is from pleasure craft nowadays, the Canal de l’Ourcq still maintains one of its key roles and purposes for which it was constructed, and that is to supply water to the city of Paris. And even though it is not classified as drinking water any longer, it provides around half of the daily requirement of water required for things such as cleaning of the sewers and providing water to the parks and gardens in Paris.